This will be very helpful when complex logic is being calculated based on a table’s rows. Using these decorators, we can completely avoid duplicating the same input again and again. It is an open-source platform that enhances the caching of pipe’s transform() function. It works with only primitive value types. It checks the value being passed and catches the response. If the same values are passed again, it will return the calculation from the cached result. It is extremely helpful when complex logic is being calculated based on the table’s rows. Using these decorators, we can completely avoid the duplicate for the same input again and again. Let's jump into the code part and see how it works. Follow the steps mentioned below. Create two pipes to demonstrate the difference between a normal pipe and the memo pipe. Now, add some logic to your pipe, as below, with memo decorator. This is the code for the other pipe without memo decorator; just understand the difference between it and the memo pipe. Create one sample component to test the memo decorator pipe and normal pipe. So, add this code. In this poc, I have a small array object with some data as you can see in step 4 - basic name, month, and date. Here, I'm going to apply the pipes which we created above and find out the difference and benefits of using memo decorators. Let's run it and see the output. 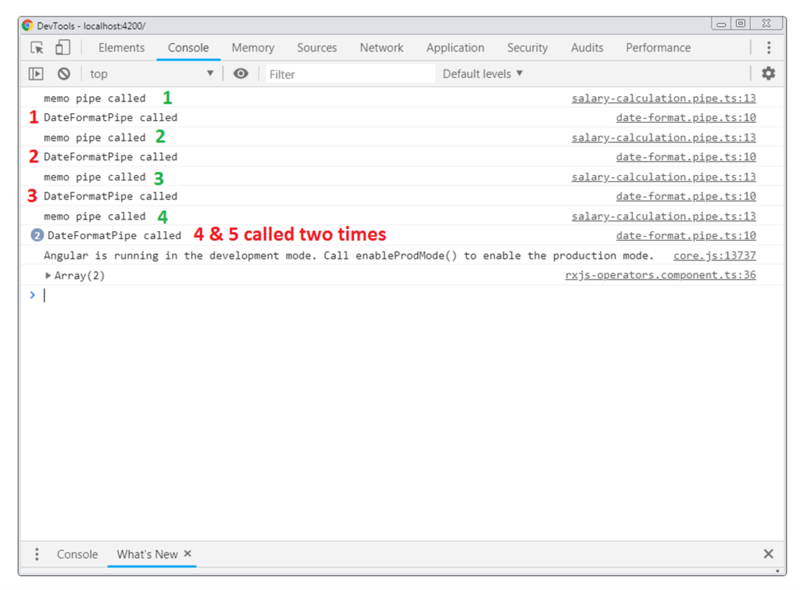 I have added a console log to each pipe to see how many times it's called. It is the browser output. Let's check the console output. I hope you got the difference. The non-memo pipe was called 5 times. It was called as per the records in an array while the memo pipe was called only four times even when the row count is 5 . The reason is that Rahul and Raj have the same month data. So, our memo decorator ignored the salary calculation as it already calculated for Rahul, so it returned the cached response value for Raj when the same month was received for calculation. Memo Decorators are very useful when it comes to an enterprise application where we do a lot of business logic operations performed on each row or transaction. It completely avoids the unnecessary calculation and helps us to boost the application performance.